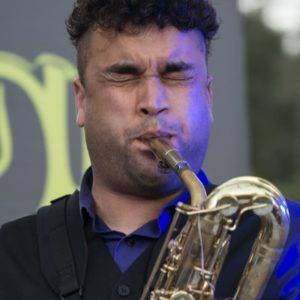 Brendan Buss is a lifelong saxophonist from the rural town of Occidental in West Sonoma County. He can be heard playing rock with the Pat Jordan Band, soul with Gene Washington and The Ironsides, Afro beat with the Black Sheep Brass Band, and vibrant marching sounds with Hubub Club Marching Band. When Brendan isn’t holding down the funky low end for Hour of Tower, he enjoys playing in pit orchestras for local theatres as well as accompanying groups like The Joyful Noise Choir. Brendan has a B.A. from Sonoma State in Jazz Studies.